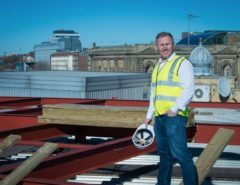 The Shankly Hotel will offer so much more than luxurious accommodation – it will be an experience. Both myself, Katie and the Shankly family are delighted to offer such a unique hotel development to our great city, as our aim is to create a hotel that will bring pride to the people of Liverpool, as it will serve not only as a hotel but as a tourist destination and historical documentation of one of Liverpool’s – and the world’s – most iconic sporting figures: Bill Shankly. Bill Shankly will forever be known as one of the greatest football managers in history, and his passion, talent, wit and determination is an inspiration not just to football fans, but to everyone. We are therefore privileged to work alongside his much-loved family to create a hotel that celebrates his life and legacy. 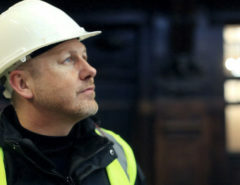 Chris, the grandson of Bill, will actually manage the hotel and will be on-hand to share his family’s experience of sharing their father and Grandfather with the rest of the world. 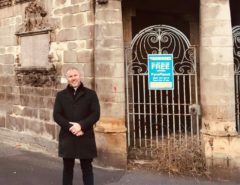 For a long time now, we have been developing a project that not only offers comfortable, stylish accommodation, but that greatly benefits the city and makes effective use of the remarkable building that was Millennium House. We are overwhelmed by the interest The Shankly Hotel has already received, and it is for this reason we wish to share our plans for the hotel so you can become as excited for its opening as we are. 16,000 square foot glass box – trust us, you will want to know more about this! The Shankly Hotel will comprise of 83 luxurious bedrooms that football fans across the world will fall in love with – and is the ideal destination for those who appreciate style, fun and flexibility. Bill Shankly was a man of the people, and so the people will create the individual names and themes for each room. The competition will be promoted via our Facebook page and those with the best ideas will be immortalised in the sleek design. We welcome all suggestions from those who have a story to share about Shankly, and no idea is too big or small. Each room will span over 2.5 times the size of an average hotel room, these rooms will have, as standard, a double whirlpool bath, air conditioning, 50 inch plasma and a PS4. We are confident people will fall in love with the hotel, which will offer famous quotations from Bill Shankly in the luxurious bathroom – and you can even absorb the wise words of the great man himself as you lie in bed after a fantastic night, as his quotes will also be immortalised on the ceiling of many of the rooms. Most rooms will also feature a kitchenette, two or more double beds and even a PS4 and karaoke – and so it’s ideal for families, friends and couples. The 175 cover Shankly Restaurant will pay tribute to Bill Shankly’s amazing life. Each area of the restaurant will represent Bill Shankly’s life, starting out with his upbringing alongside his four brothers and five sisters in Glenbuck, a remote Scottish mining village in East Ayrshire, Scotland. It is important to note that this Hotel pays homage to a man who is widely acclaimed as the father of Liverpool and not Liverpool F.C. We should rejoice in the fact that Bill loved our city and its people, and even made this City his home. The next area of the restaurant will pay tribute to Shankly’s life as a miner, which undoubtedly resulted in Shankly’s strong work ethic. It is a story that not many of his fans know much about, and it is a time that helped shape Shankly’s social viewpoint. Different areas of the restaurant will also honour his time as a footballer at various clubs, including Carlisle United – Shankly’s first professional club as a player and manager. Areas will, of course, pay tribute to Shankly’s extraordinary management career at Carlisle Utd, Grimsby Town, Workington, Huddersfield Town and Liverpool FC. For many years the Shankly family have loaned various pieces to the Liverpool museum, but they have so much more, with such documents as the original contract between Bill and Liverpool F.C., which is, in my view, the birth certificate of Liverpool F.C. With other, such artefacts as Bill’s This is Your Life Album and his telegram from Neil Armstrong, who was the first man on the Moon, plus many other items. Eden is one of the most exciting projects we have ever embarked upon, and will be the crown jewel of The Shankly Hotel. Two lots of stairs and a lift will lead to Eden that will offer a tree-lined rooftop garden, which will offer the only unencumbered rooftop view of our beautiful city. 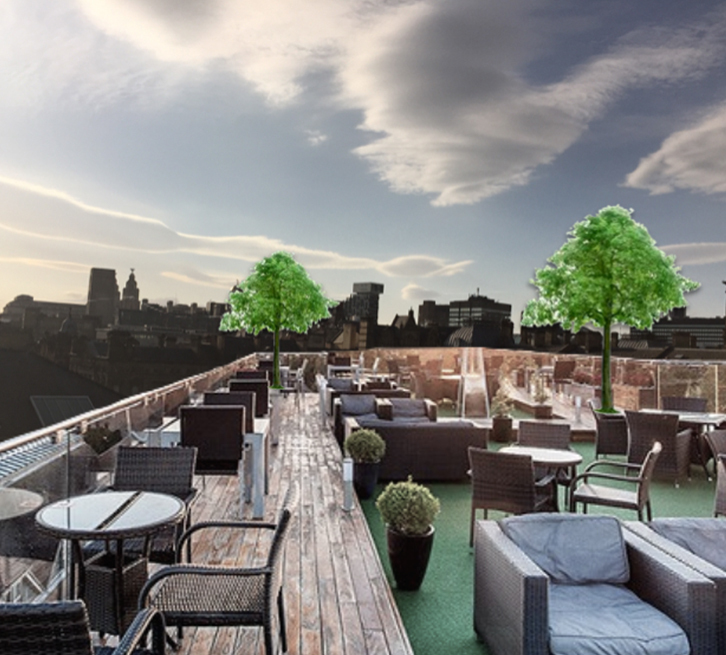 Guests can look out at some of Liverpool’s most iconic landmarks, including the Liver Building, Three Graces, Pier Head and the buzzing town. 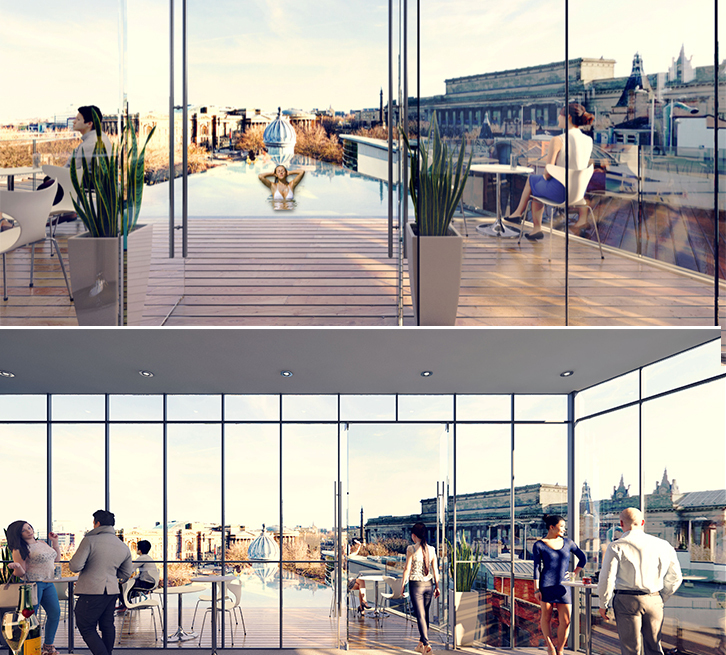 Eden will also include a magnificent glass box, which will allow our guests to enjoy the view in all climates. So, you can enjoy the beauty of the outdoors and the city of Liverpool in all weathers. The glass box will also feature a stunning infinity pool that guests can enjoy come rain or shine. The glass box will also feature an incredible jagged edge that will reflect of the various buildings in the vicinity of Millennium House, and will feature information on the history of each building. We expect The Serpent to become one the biggest attractions at The Shankly Hotel. We said earlier that we wanted to offer our guests an experience and our corkscrew slide – which we have given the working title of The Serpent – will most definitely do just that. So, what is The Serpent? It’s basically a 100ft drop chrome corkscrew slide that will start out from the very top of building and will lead back into the bottom of the hotel. People can ride this aesthetically-pleasing slide for £5 and – here’s the amazing bit – all the money will be donated to a monthly charity of our choice. Surely everyone wants to see people coming down the slide, right? 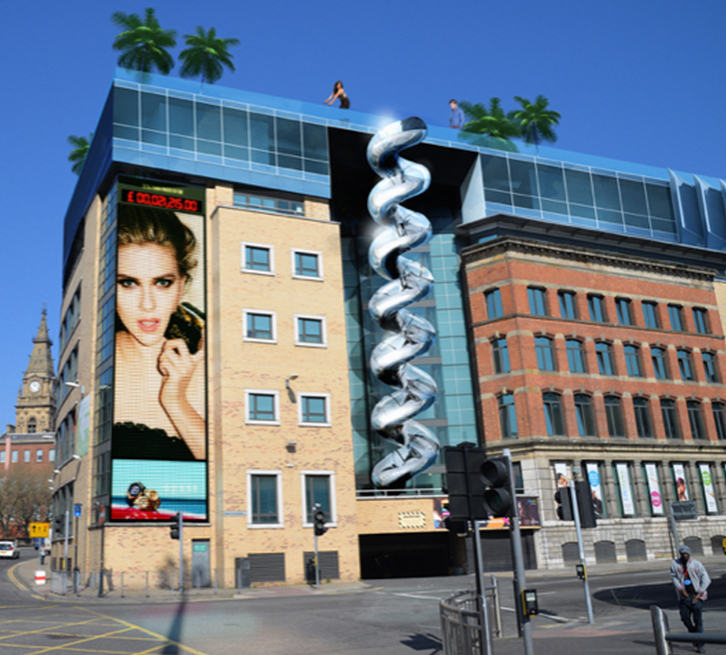 Well, the people of Liverpool can, as we plan to install a 100ft digital signage screen on the side of the building, so those in the vicinity of Queen’s Square can watch as a person happily slides down The Serpent. We’ll also feature a charity accumulator on the screen to update the public on how much we’ve raised, and to challenge more people to have a go. We plan to create a 500 cover conference centre within the hotel, which will offer sophisticated meeting places for companies in various industries. The centre will also double as a 250 cover wedding venue, and we can even include a 500 cover marquee on the roof to cater to various wedding parties. With exceptional views of the city from Eden, stylish and flexible bedrooms and a stunning restaurant, we are confident we can provide our guests with a wedding venue that exceeds their wildest dreams. 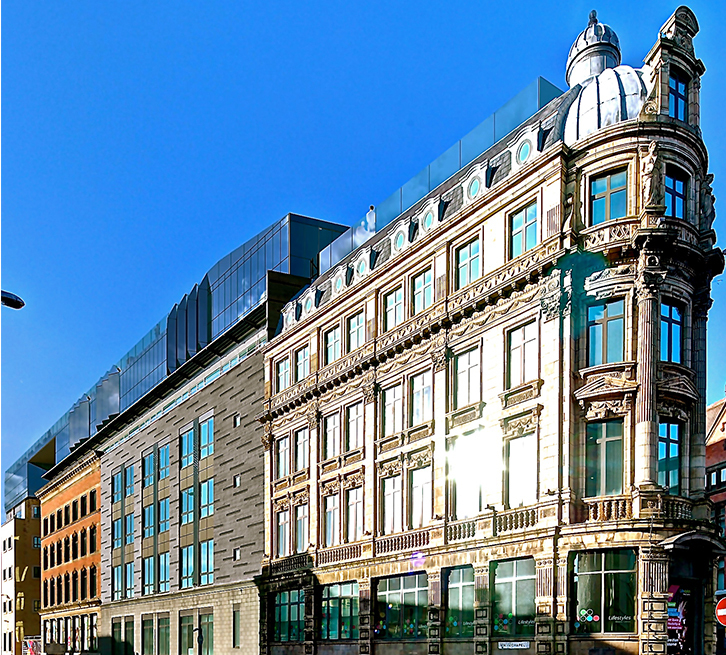 Signature Living is the beating heart of all our hotel projects – and this hotel framework is embedded in each and every hotel we create – from Stanley Street and 30 James Street to our new Shankly Hotel. Our sole aim is to offer stylish, comfortable and spacious accommodation that will make our guests never want to leave. It is for this reason we plan to include 26 Signature Living apartments within The Shankly Hotel – each one offering a fantastic theme unseen in any other hotel. We launched the first Signature Living hotel back in 2008 in Victoria Street, and it’s hard to believe that less than 10 years later we will soon be the largest accommodation provider in the city, offering 1,200 beds by August 2015. Our unprecedented success is all thanks to the public – who have helped form the Signature Brand that myself and the team are so proud of. People – not just in Liverpool – but in all corners of the world, have fallen in love with Signature Living, and we are overwhelmed by the sheer number of followers on our growing Facebook page. As a thank you, and to ensure we continue to create hotel rooms that people want to stay in, we have launched a Facebook competition that will allow the public to pick our 26 new room themes. We don’t care how weird, wacky or silly they might seem, we want to hear each and every idea. Just like with the Shankly Hotel, the lucky winner’s names will be immortalised into their winning theme, and they will also receive a free night stay at our new hotel.